Hybrid warfare has been an integral part of the historical landscape since the ancient world, but only recently have analysts – incorrectly – categorized these conflicts as unique. Great powers throughout history have confronted opponents who used a combination of regular and irregular forces to negate the advantage of the great powers' superior conventional military strength. As this study shows, hybrid wars are labor-intensive and long-term affairs; they are difficult struggles that defy the domestic logic of opinion polls and election cycles. Hybrid wars are also the most likely conflicts of the twenty-first century, as competitors use hybrid forces to wear down America's military capabilities in extended campaigns of exhaustion. Nine historical examples of hybrid warfare, from ancient Rome to the modern world, provide readers with context by clarifying the various aspects of conflicts and examining how great powers have dealt with them in the past. "… highly readable, cohesively organized, and enthusiastically recommended as an invaluable guide for understanding how previous antagonists have sought advantage with strategic combinations. It is suitable for serious students of military history, analysts of contemporary conflict, and professionals at the command and general staff college level." "The book achieves its ambitions in extending hybrid war in historical time and space, and of being a valuable starting point from which military professionals and historians can further explore the topic." "Hybrid Warfare will prove rewarding reading for anyone interested in the problem of 'irregular' warfare, providing much food for thought about what is likely to be the most common form of war in our century." With the advent of the atomic bomb, pundits predicted that war had changed forever. The intervening years proved them wrong. Since the United States became embroiled in Iraq and Afghanistan in the first decade of the 21st Century, a new breed of analysts have now posited the emergence of a new type of war - with the appellation of ‘hybrid warfare.‘ In this small volume, the editors show that far from being an emerging form of conflict, hybrid warfare - the buzz phrase doing the rounds of the Pentagon - has existed for centuries, and that a failure to understand its character, complexity and, importantly, the nature of the societies waging it, has resulted in either defeat, or falling far short of the expectations originally intended. Those who have been successful, on the other hand, have left on long legacy of ill-feeling, and often hatred, amongst the conquered peoples. Hybrid warfare is defined as a conflict in which a belligerent employs both conventional and unconventional forces, such as irregulars, partisans, and guerrillas, and while not new, it presents Western armies with an increasingly difficult problem, should they become involved in one, as the boundaries of war become blurred. In nine essays ranging from the 1st Century AD to the American defeat in Vietnam, each written by a different historian, we are presented with a wide spectrum of such wars, across four continents and Ireland. 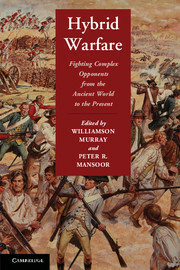 Interesting though they are, in this reviewer’s opinion the opening essay on the Romans in Germania draws a long bow in placing the conflict in the hybrid warfare basket, and the example of Tyrone’s Rebellion 1594-1603, with a minor Spanish intervention, is more an example of a nascent hybrid war that was snuffed out before it could take hold. The remainder, however, provide fascinating studies of the brutality, complexity, and enormous difficulties confronting conventional forces fighting a ‘hybrid’ enemy. 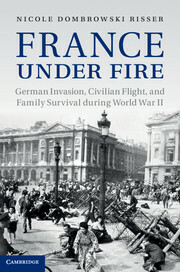 Much of the book addresses the British and American experience. Four essays describe Britain’s efforts, both in combatting hybrid forces successfully and unsuccessfully, and employing them to defeat an opponent. John Ferris’s ‘Small Wars and Great Games: The British Empire and Hybrid Warfare, 1700 - 1970’ covers a broad canvas, and concludes that overall the British have been remarkably successful at conducting and combatting this form of war. Three essays address the American experience - successfully conducting one during the American Revolution, and two of combatting it: successfully during the Civil War, and unsuccessfully in Vietnam. Rounding out the survey, are two fine essays on the Franco-Prussian War and the Second Sino- Japanese War. All are well written, informative studies, and each bring interesting perspectives to the subject. Together they provide a sound basis in understanding, or least attempting to understand the hybrid form of war, but as they clearly show, it is not a new transition confined to the first decade of the 21st Century. Williamson Murray’s ‘Conclusion’ draws together the threads of these studies, pulling out trends from a complex weave of factors that mark the nature of hybrid warfare. As with all his works, Murray’s perceptive and instructive writing eschews the theoretical, and esoteric approach, but is firmly rooted in the historical record, and the realities of past experience. One cannot but feel that Western societies, with their preference for quick wars, and steadily waning support for those that drag on, will increasingly fail to succeed in future hybrid wars. They are costly in resources, money and time, a point the British quickly recognised during the American Revolution, and hence concluded peace with the recalcitrant colonists. There is much to be learned from this fine book. 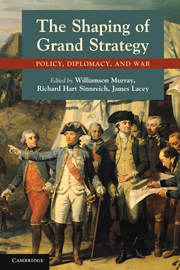 Perhaps the biggest lesson, Murray concludes, is: ‘Do not fight a hybrid war unless the most fundamental interests of the state are at stake.‘ It is a most useful contribution to the study of war in its most difficult form. 11. What the past suggests Williamson Murray. 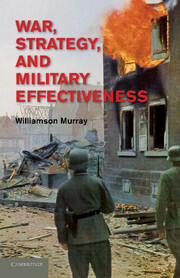 Williamson Murray is Professor Emeritus of History at Ohio State University. At present he is a defense consultant and commentator on historical and military subjects in Washington. He is the author of War, Strategy, and Military Effectiveness and Military Adaptation in War (both Cambridge, 2011). 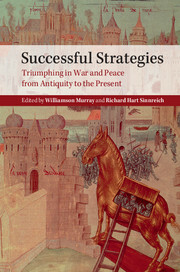 He is co-editor of numerous books on military and international history, including The Shaping of Grand Strategy (with Richard Sinnreich and James Lacey, Cambridge, 2011), The Making of Peace (with James Lacey, Cambridge, 2008), The Past as Prologue (with Richard Hart Sinnreich, Cambridge, 2006), The Dynamics of Military Revolution, 1300–2050 (with MacGregor Knox, Cambridge, 2001), Military Innovation in the Interwar Period (with Allan R. Millett, Cambridge, 1996) and The Making of Strategy (with Alvin Bernstein and MacGregor Knox, Cambridge, 1994). 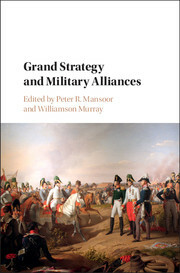 Peter Mansoor is the General Raymond E. Mason, Jr Chair of Military History at Ohio State University. He assumed this position in 2008 after a twenty-six-year career in the United States Army that culminated in his service in Iraq as the executive officer to General David Petraeus, the commanding general of Multi-National Force in Iraq. He is the author of The GI Offensive in Europe: The Triumph of American Infantry Divisions, 1941–1945, which was awarded the Society for Military History's distinguished book award and the Army Historical Society's distinguished book award in 2000. He also wrote a memoir titled Baghdad at Sunrise: A Brigade Commander's War in Iraq (2008), which was awarded the Ohioana Library Association distinguished book award.